Ein Patient erhält vor der Schulteroperation einen interskalenären Plexuskatheter. Die Anlage erfolgt nach Narkoseeinleitung in der Technik nach Winnie. Durch den Katheter werden 5 ml Ropivacain injiziert. Im Aufwachraum fällt leichte Dyspnoe ohne Stridor auf, die sich spontan bessert. 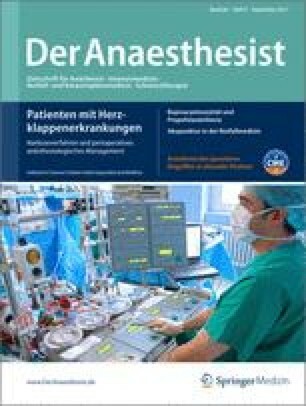 Nach einem erneuten Ropivacainbolus entwickeln sich Dyspnoe und eine einseitige Parese des kontralateralen Arms; der Patient wird hypoton. Die Computertomographie zeigt eine epidurale Katheterlage. Rückenmarknahe Komplikationen der interskalenären Regionalanästhesie sind besonderes bei medialer Stichrichtung möglich und in der Literatur mehrfach beschrieben. Symptomatik und Empfehlungen zur Vermeidung werden diskutiert. A patient received an interscalene plexus catheter before shoulder surgery. After induction of general anesthesia catheter placement was performed with Winnie’s technique and 5 ml of ropivacaine was injected via the catheter. In the recovery room slight dyspnea without wheezing was observed which improved spontaneously. Following another bolus of ropivacaine, dyspnea and paralysis of the contralateral arm developed and the patient became hypotensive. The tomography scan showed epidural malpositioning of the catheter. Neuraxial complications of interscalene regional anesthesia are especially possible with medially directed insertion of the needle and have been described many times in the literature. The symptoms and recommendations for prevention are discussed.